U. S. Sen. John Cornyn, R-TX, talks with the media, along with, left to right, U.S. Sen. Thom Tillis, R-NC, U.S. Representative John Carter, R-TX, U.S. Representative Mike Conaway, R-TX, and U.S Representative David Rouzer, R-NC, before touring the Rio Grande at Anzalduas Park February 20, 2017 in Mission. 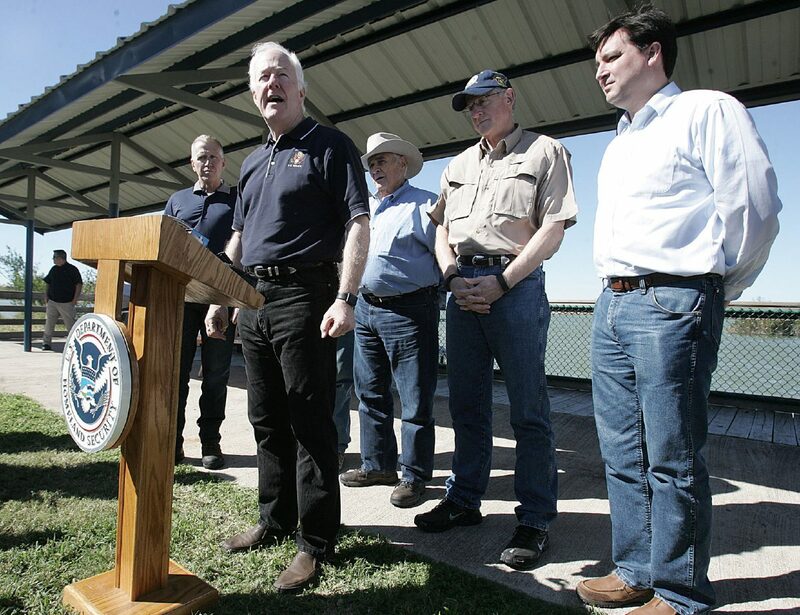 Sen. John Cornyn on Thursday revealed a $15 billion border-security bill that could enhance technology and staffing along the border and at ports of entry. Sen. John Cornyn on Thursday revealed a $15 billion border-security bill that could enhance technology and staffing along the border and at ports of entry. Cornyn continued to juggle between proposing realistic border security solutions without indulging in strictly pro-border wall resolutions that President Donald Trump has promised. Cornyn said a physical barrier is appropriate in certain spots along the border, but there is not a “one size fits all” solution. The bill, called Building America’s Trust Act, presents multi-layered infrastructure improvements, efficiency enhancements at ports of entries and more Customs and Border Protection agents. Republican Sens. Thom Tillis from North Carolina, John Barrasso from Wyoming and Ron Johnson from Wisconsin co-sponsored the bill. Cornyn brought Tillis on a tour of the Rio Grande Valley and Laredo during a February trip. This bill doesn’t necessarily spend money, Cornyn said, but will give those working in appropriations to authorize the money. The bill also does not include anything regarding Mexico paying for a border wall, which is what Trump pledged throughout his presidential campaign. However, a Washington Post report Thursday revealed that Trump told Mexican President Enrique Pena Nieto on Jan. 27 that he realized funding for a potential border wall would have to come from other sources. The funding “will work out in the formula somehow,” Trump said, according to the report. Trump later said that “it will come out in the wash, and that is okay.” But “if you are going to say that Mexico is not going to pay for the wall, then I do not want to meet with you guys anymore because I cannot live with that,” the report said. Regarding ports of entry, Cornyn’s bill proposes $4 billion over the next four fiscal years. It directs the Department of Homeland Security to expand the primary and secondary expansion lanes for vehicle, cargo and pedestrian inbound and outbound inspection lanes at the 10 highest volume ports of entry along the southern border. This could potentially include the Pharr-Reynosa International Bridge, which is the top produce port of entry in the country. The bill also funds and expands the surveillance and intrusion technology program at ports of entry. Finally, it requires DHS to upgrade all existing license plate readers at ports of entry on incoming and outgoing vehicle lanes.